How have I never poached salmon before? 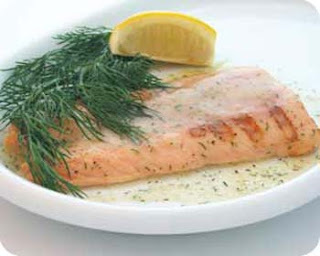 A delicious bath of butter, oil and wine seeps into the salmon. Then it's topped with dijon mustard and dill. It tastes like a tender piece of heaven. I served with roasted sweet potatoes and arugula salad. 1. Melt butter over medium heat in a large non-stick saute pan. Add oil, wine and garlic and heat through for about three minutes. 2. Place salmon in the delicious bath of goodness, top side down. Top with the lid and cook for 3 minutes. 3. Flip salmon over, and spread a little dijon mustard on each piece. Spinkle Old Bay Seasoning, and top with dill. Replace lid and let cook for 3 more minutes. 4. Remove from heat, and ensure salmon easily flakes with a fork.